Baptism is the next step a person should take after accepting Jesus Christ into their lives. Baptism is an ordinance of the church where a person is dipped in water as an outward symbol of their relationship with Jesus Christ. It is an outward symbol of an inward transformation. It is also an opportunity to celebrate your faith by inviting your family and friends to witness your baptism. At The Bridge, we baptize by immersion signifying being identified with the death, burial, and resurrection of Jesus Christ. 1. You have given your life to Jesus Christ but have never been baptized. 2. You didn’t have a relationship with Jesus Christ when you were first baptized. 3. You weren’t baptized by immersion. Individuals under the age of 18 who wish to be baptized will require parental consent. Please download the following FORM. Send completed and signed form to info@thebridgedc.org. If you desire to be baptized, simply fill out the Baptism registration form. 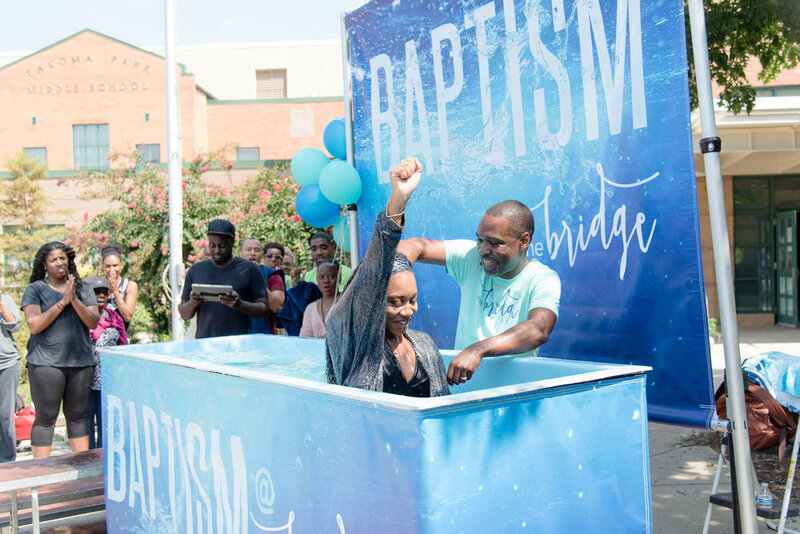 You must also attend a short Baptism Orientation, offered directly after the Sunday worship experience the week before and the Sunday of the baptism. If so, describe the circumstance of your baptism and when your were baptized. Why are you seeking to be baptized? If so, please state briefly how and when you accepted Jesus Christ as your Savior. Briefly describe what you believe about Jesus Christ. When would you like to be baptized? We recommend baptism as soon as possible after accepting Christ. Baptism Sunday is typically the 3rd Sunday of the month, April - October, unless otherwise noted. Baptism can be a tricky subject for many Christians to figure out. We tend to have a lot of questions about the subject. Do I have to get baptized to go to heaven? Does it complete my salvation process? The whole ordeal seems a little bizarre – what’s the point of it anyway? In this message Pastor Jumaine outlines what Baptism is really about.